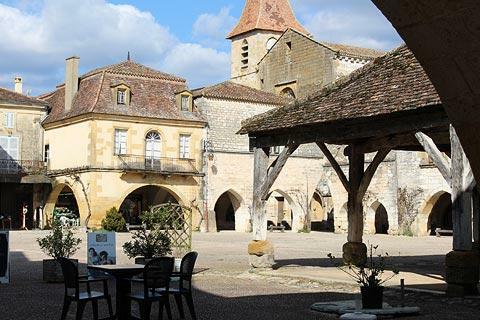 Monpazier is 15 kilometres to the south of Domme towards the southern edge of the Dordogne region, and is listed as one of the 'most beautiful villages of France'. 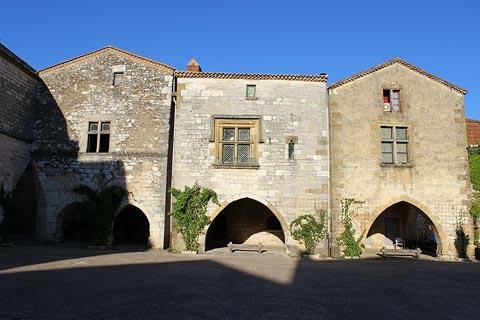 The origins of Monpazier date from the end of the 13th century when it was founded as a bastide town in 1284 by King Edward I of England. France This Way comment: Monpazier is a remarkable place that is usually considered to be the most intact bastide town remaining in France, and is certainly one of the most impressive villages we have seen in France. When you arrive you will find car parks on the outside of the pedestrianised historic centre. 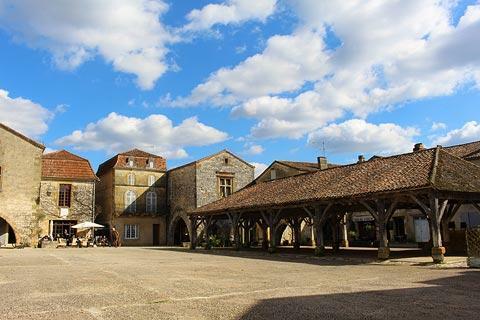 Although the village is situated on a hill, the centre of Monpazier is flat and easily accessible. 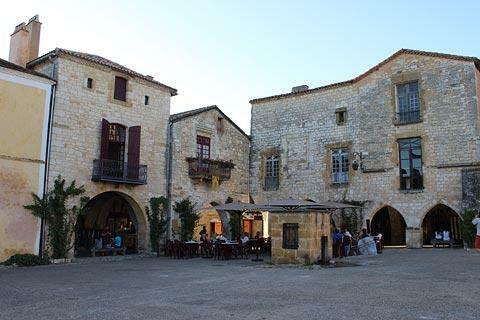 Broadly speaking the village has a large central square, a smaller square with the church close by, and straight streets lined with medieval buildings running out from this centre to the edges of the town and parts of the historic fortifications. The town is entered through large stone gateways through these defensive walls. 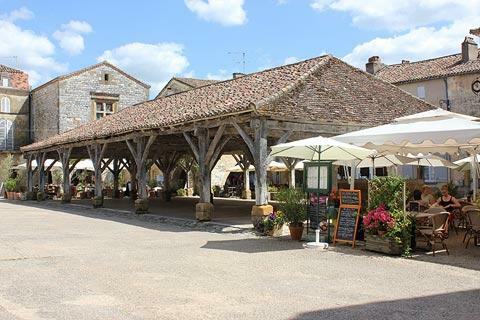 Around its paved central square, containing the original market hall, Monpazier retains many ancient buildings and the original arcades around the edge of the square. There is perhaps little to actually say about the village - it is the general impression it creates that is the attraction rather than any particular individual highlights - but don't let that deter you from visiting! The houses and arcades around the edge of the square (the sheltered pathways under the arches) are the highlight. 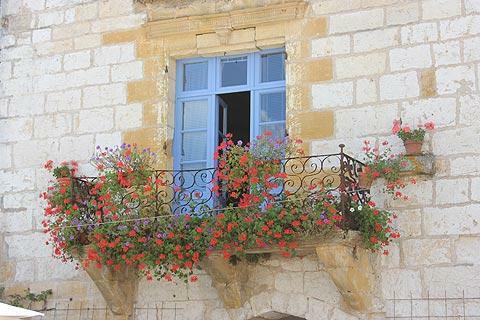 More than 30 of the buildings in Monpazier are classified as 'national monuments', and there is little to spoil the impression that all is much as it has been for the last 700 years. Monpazier is one of the few places where you can take loads of photos (and you will) and none show any building less than 400 years old! 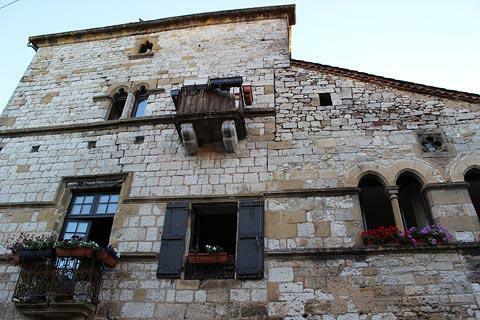 The most remarkable feature is that many of the houses in the centre are different to each other in architectural style, with a variet of arcades, renaissance style windows and wrought iron balconies on each house. 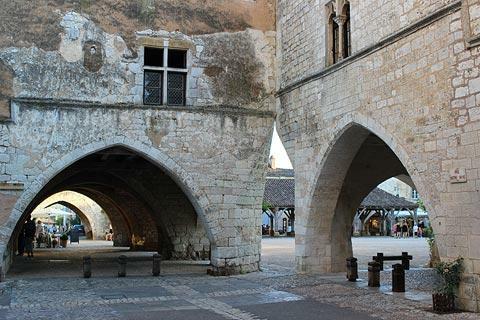 The ancient market hall in the centre of the square is very typical of medieval markets, and you can still see the old 'tin buckets' in the hall, which are said to be the original 'weighing station' for oils and wheat etc. 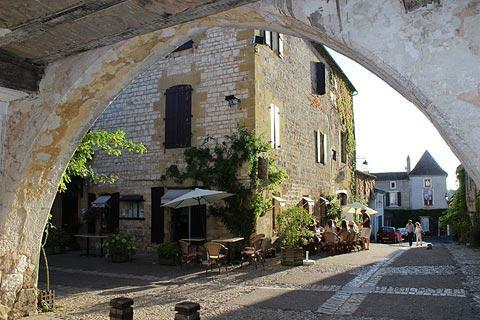 Although the centre is quiet (apart from tourists), you will find several cafes in Monpazier as well as various shops selling arts and crafts. 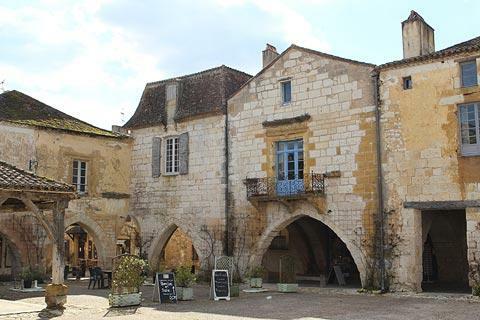 There are more artisan shops here than most villages, many selling high-quality products, which helps Monpazier stay alive in the winter when many villages in the Dordogne are completely closed! Be sure to explore the side streets of the village where you will find more charming houses and occasional shops and cafes. 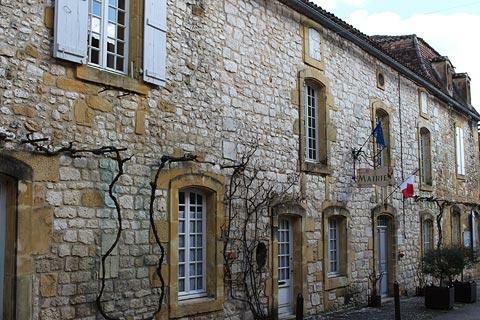 As in the centre there are many attractive houses - see for example the tall Maison du Chapitre is on the Rue Notre-Dame and the Convent des Recollets for examples, and the mairie just outside the south-east corner of the centre. Just outside the main square, the 13th century Church of Saint-Dominique has an attractive carved entrance. Be sure to also stroll to the edges of the town (outside the Monpazier fortifications and only about 200 metres from the centre) to see the views that look south across the woodland and valley. Monpazier is an unmissable highlight of a visit to the region and a visit to this unique village is highly recommended: we live close by and have visited more than 100 of the 'most beautiful villages of France' and never cease to be impressed even after visiting Monpazier on numerous occasions, at all times of year. 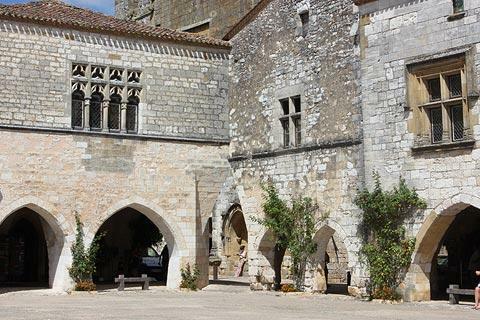 The Dordogne department to the north and the Lot-et-Garonne department to the south both have a very large number of interesting sights and villages. 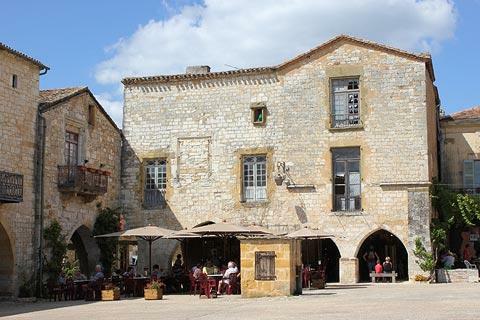 For somewhere a little off the beaten track, visit the medieval villages of Villereal or Issigeac to the west, or Monflanquin a little further to the south and also a listed 'beautiful village of France'. 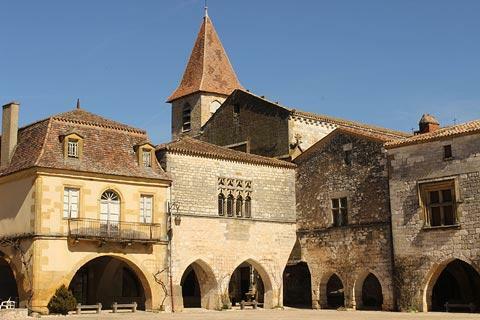 There are numerous castles, villages and scenic highlights close to Monpazier - see the guides for Dordogne and Lot-et-Garonne for more details. 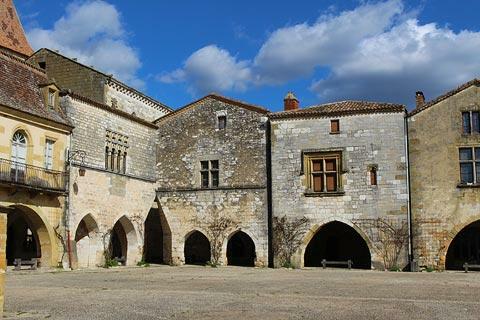 Monpazier is also at the eastern end of the Dropt Valley, which is a less visited region that also contains many small towns and villages of interest.